We understand the teenage years are a challenging time – juggling sport, growth, school and even work. Therefore Injury Rehabilitation requires a specialist approach to manage these competing challenges. At Be Your Best Physiotherapy, we have over fifteen years experience managing teen sports injuries at Dandenong Stingrays Football Club. on treatment and a return to gym, running or sport program. This specialist Teen Sports Injury rehab service results in quicker return to sport and reduced risk of re-injury. We can liaise with coaches and personal trainers to assist your return to activity. 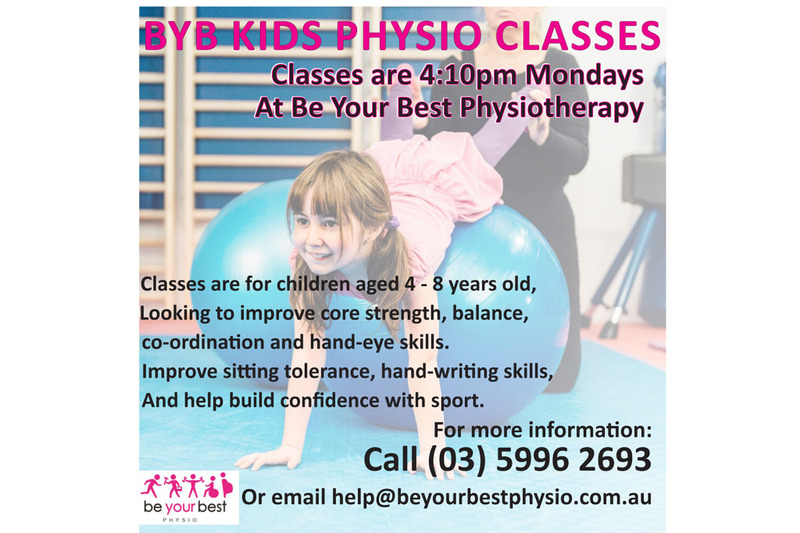 The Be Your Best Kids Physio class is for 4-8 year old children. The goal of this class is to improve strength, co-ordination, balance and core strength which will assist hand-writing skills, ball skills, reduce fatigue and increase concentration at school. Please call 5996 2693 or email help@beyourbestphysio.com.au for more information and bookings. Our specialist Physiotherapists can assist with the management of a number of pregnancy and post-natal issues.